After reading Darcy Moore’s blog post Social Reading: Fad or Future?, I got to thinking a lot about my own reading habits. I can’t remember a time when I haven’t been a reader. I can clearly remember as a child trying to sneak my bedside lamp back on in the middle of the night so I could finish reading my book (Mum and Dad always seemed to hear the click and tell me to turn it off again). I love talking about books with other people, and until recently, this has usually meant begging them to read the books I love and then nagging them until they do. When I discovered Goodreads, it opened up a whole new world for me. Here were online communities who wanted to talk about the books that I was reading! Not only that, there were book clubs reading books in genres I enjoyed, recommending new titles for me to try. Two of my bookclubs began holding Google+ hangouts to discuss the monthly book choices, and I got to meet and talk to some wonderful people, some of whom I have now met in person several times. Not that I’ve always been so embracing of change. When e-book readers first came out, I always swore I would never get one. I was adamant that they could never replace the tactile sensations that go along with reading a paper book. Fast forward to a few years later, and I was having trouble finding all the books I needed in time for my book clubs. There are no bookshops near where I live, and I was forced to order online much of the time. After receiving my books after the month was finished (and not being able to read them in time for the discussions), I finally ‘bit the bullet’ and went out to buy a Kindle. Now, I cannot tell you how much I LOVE my Kindle. I love being able to buy a book an instantly begin to read it. I love being able to highlight my favourite parts of the book (very handy when you know you will be discussing the book later in the month) and see what others have been highlighting. I REALLY love the fact that my book can be synced across devices – so if I’m out and about and have a few minutes to read, I can take out my iPhone and read, and it will remember where I am up to on my Kindle at home. Of course, Kindle does have its down sides. Don’t get me started about the fact that some books are available in the US but not in Australia, or the ridiculous price difference between Australian and US titles. I miss being able to put the books up on my bookshelf for all to see (although, at the rate I am going, I will need a bigger house if I keep buying books). I recently met author Hugh Howey, and could have gotten him to sign my copy of his book ‘Wool‘, only I had bought it on Kindle rather than paper. He told me he actually gets asked to sign people’s Kindles fairly often these days. I don’t think it’s quite the same! Despite the drawbacks, I am grateful for the changes that have happened in my reading habits over the last few years. I have made some great friends, read some books I might never have otherwise tried, and made myself a to-read list that seems never-ending. I love the opportunities for social reading new technologies have given me. 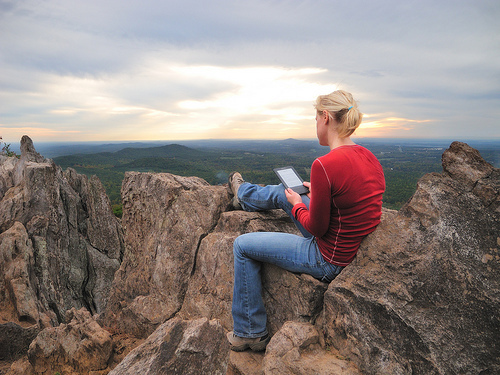 Do you enjoy reading eBooks, or do you prefer more traditional, paper books? It’s wonderful to see libraries embracing and encouraging these new technologies! I think I’ll have to check out my local library and see what they have to offer. With a baby on the way I know I’m going to have a lot less money to spend on books pretty soon, so this could be the answer for me. Kirsten, like you, I was hesitant to take the plunge into the world of ebooks, but now I love being able to borrow books from the local library through Overdrive and read them instantly. I’m also getting into the habit of buying ebooks to read on my iPad. They’ll never replace the many books on my bookshelf, but they are certainly handy to have with you to read on holidays or waiting to pick up the kids. My next set is to join Goodreads so that I’ll always have a list of recommendations waiting. The school I work at has been offering digital books to our students on Overdrive for about 5 years now and the thing I have noticed is that my reading habits are similar to the students. It’s all about ACCESS. They don’t seem to mind what the format it – print or digital – but it’s just whatever they can get a hold of. When you said that you can’t always access the books you want so you get them on your Kindle, this idea resonated with me. I love it when a student tells me they were borrowing books on their iPad during their family holiday. They could still access our library services and I think this is one of the most amazing things technology has given us!